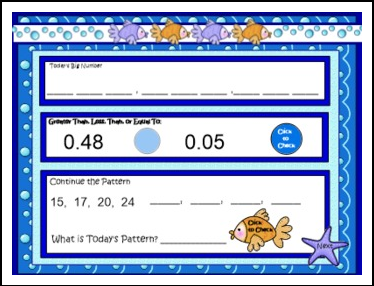 …because calendar math is not just for primary grades! Have you been thinking about incorporating a math calendar routine in your 4th or 5th grade classroom? My SMARTBoard Math Calendar Sampler lets you check out 2 full days of Day Files, which are one component in my year-long math calendar routine. There are 8 sets of Day Files, for a total of 180 school days. Each Day File is 3 pages long, (except for the first set, which is 2 pages), and provides a spiral review of key concepts and vocabulary that just don’t get enough repeated practice in the typical math program. I provide student recording sheets in two sizes and complete directions for how I use each component in my classroom. As you look at the sampler, keep in mind that this two-day peek does not show you all the concepts included in this, or any other set. Because there are so many skills students need to understand, there are other topics that might appear on other days. “Big Number” does appear each day, and is based on the calendar date. So for instance, on September 5, 2013, the Big Number would be 9,052,013. Check out the previews for each set to see more details. The other component of Math Calendar is the Core Calendar and Set 1 which you can preview by clicking the link. It is an 8-page Smart Notebook file that gets saved every day, because you keep adding to the elements. The Core Calendar comes bundled with the first set of Day Files, so you can check out an entire month of the program at a reduced price. 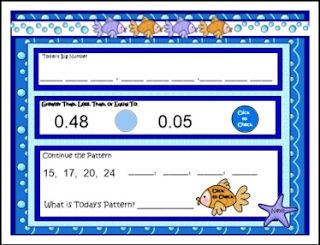 Math Calendar is an excellent way to give students regular and repeated practice with a wide variety of key math concepts and vocabulary in just 15 minutes a day. Since implementing it in my classroom, I have seen tremendous growth in my students’ test scores! It is colorful, interactive, aligned with Common Core standards, and your students will love it! It is always among my students’ favorite memories of the year! If you have any questions about math calendar, I would be happy to answer them. It is the single most important thing I do in math every day!